Rightwingers are using Detroit's fiscal crisis—much like they did in New York in 1975—to undermine the social safety net. Detroit has now declared bankruptcy. A judge has ruled the act illegal—a decision that may or may not stand. Naturally, New York’s fiscal crisis thirty-eight years ago comes to mind, though in many respects the differences are more important than the similarities: New York was one of the world’s financial and cultural capitals, its private economy largely thriving; as such, the news of government’s bare coffers was shocking, a revelation, something the world at first had a very hard time getting their mind around. 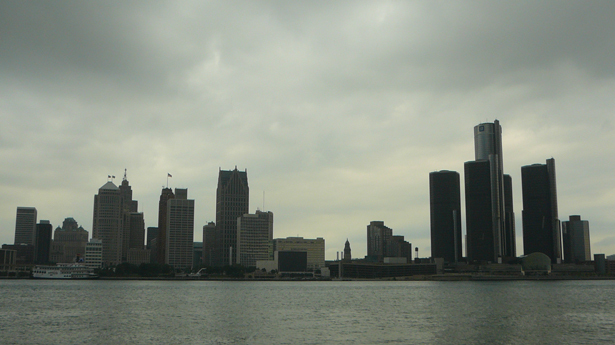 While what’s happening to Detroit, no one’s idea of an economic capital, isn’t surprising at all. But note a striking similarity: reaction of those on the right. To wit: here comes Senator Rand Paul, saying nothing would be more splendid than to let a major city go bankrupt—because with bankruptcy, you get “new management, better management, and by getting rid of contracts, contracts that give you where [sic] public employees are getting paid twice what private employees are and things come back more to normal.” No matter that so far the White House says only that it’s “monitoring” the situation, though former Obama auto czar Steve Ratner says he hopes Obama will pump federal money into the city. That is what Paul distorted into his claim that “apparently” the president is “making indications that Detroit can be expected to be bailed out.” And that, he says, will happen only “over his dead body.” Because municipal bankruptcy would give Paul the chance to do what right-wingers like him always do, starting with New York in 1975: make excuses for slashing the public sector. Shock doctrine stuff, in other words. The unwinding of what’s left of the welfare state, by whatever means at your disposal. Same story, then and now. In 1975, its most prominent voice was William Simon, President Ford’s Treasury secretary, who leveraged his work as the butcher of New York to become a major conservative movement leader. The roots of the Great New York City Fiscal Crisis lay in the recession of 1974–75, which hit the Northeast with a speed and force all out of proportion to the rest of the country. New York had always supported a program of middle-class entitlement unlike anywhere else, a sort of socialism in one city: subsidized housing and daycare centers; free college at the world-class City University of New York; free museum admission; nineteen municipal hospital, many of them world-class; free directory assistance—amenities that seemed only natural for a metropolis transforming itself, in the boom years after World War II, into the greatest city in the world. It worked, until it didn’t. The city’s manufacturing base declined, and the unemployment rate, under 5 percent in 1970, hovered above 12 percent—shades, but only shades, of Detroit. White middle-class New Yorkers, fearing crime, fled to the suburbs—definite shades of Detroit there. Federal and state aid leveled off; expectations that Richard Nixon’s national health insurance bill would relieve the city of its massive outlays for Medicaid came a cropper when Congress voted it down (conservatives because it was too generous, liberals because it was not generous enough). Bills came due that this newly atrophied level of revenue simply could not cover: by the the end of 1974, the city’s debt was $11 billion, a third of that in short-term notes soon to come due, and over 11 percent of the city’s spending went to interest payments on that debt—to banks, suddenly reconsidering their lending practices in a recession. Other tax shelters started looking more attractive, So did other customers—for instance, some resource-rich Third World nations. So it was that banks started to asking for some of that money back, and started charging more interest to let them rent more. In December of 1974 Mayor Abraham Beame made a pilgrimage to Washington, DC, to meet with Treasury Secretary Simon. Beame explained the actions he had already taken to correct the city’s fiscal imbalances, freezing most city hiring and merit pay increases; he then argued that, given that America’s greatest international city unfairly had to pay higher interest rates than any municipality in the country, it would be in the national interest for the Treasury Department to loan New York the money it needed by buying municipal paper directly. There was something disingenuous in that reaction. Bill Simon had formerly been senior partner in charge of government and municipal bonds at Salomon Brothers—one of the people in charge of lending the money hand over fist during the time when much of this debt was being incurred. In the late 1960s and early 1970s, Simon had even served on a debt advisory committee set up by Beame back when he had been New York’s comptroller under the previous mayor, John Lindsay. If New York had been borrowing beyond its means, William Simon was one of the people personally responsible. He would later complain that he had been gulled—that the city’s “Byzantine accounts” and “tortuous accounting practices” had been willfully devised to forestall just the kind of fiscal reckoning he now insisted the city so desperately required, and that “even the most sophisticated financiers and the Treasury Department itself were totally unprepared” for such a violation of “the basic legal and ethical pact between the city and its debtors.” And surely, within City Hall, there was plenty of blame to go around—just like in Detroit. But other motives, other assumptions, lay beyond Bill Simon’s recalcitrance as well. These were ideological. How to get it done? Like Paul, with his absurd made-up notion of public employee workers making twice what equivalent public sector workers make, they lie—about what Simon called overpaid, “parasitical” municipal workers, separate from the “productive population,” drawing “appalling” pensions. For what it was worth, the pension of the average retiring New York City policeman—$9,000—was $3,000 less than in Chicago, $8,000 less than Detroit and less than half that in Los Angeles and San Francisco; city teachers and firemen also earned less than in all those cities, with a considerably higher cost of living. The city had fewer citizens per capita public assistance than Philadelphia, Detroit, Milwaukee, Chicago (an oft-repeated claim that the city spent the most on welfare in the country ignored the fact that expenses covered almost elsewhere by state and county governments were borne by city governments in New York State); among the private corporations that paid their workers out more in pensions than New York City were General Motors and First National City Bank (later known as CitiBank, the financial institution most aggressive in pushing Beame’s austerity budget, whose chairman Walter Wriston, municipal labor leaders never tired of pointing, earned $425,000 a year). Mayor Beame, for his part, never tired of pointing out all the other cities facing similar balance sheet woes—among them Grand Rapids, Michigan, the president’s hometown. But soon, Simon won the president to his side. In January of 1975, the city’s comptroller canceled a planned sale of municipal notes; in February, a second sale was canceled. The city’s Urban Development Corporation became the first major government agency to go into default since the 1930s. Two weeks later, on March 6, the city offered another note on the market—and didn’t receive a single underwriting bid. By May, the city’s debt was $12.3 billion, the word had gone forth from the great investment banks that such debt was unmarketable at just about any interest rate, and officials predicted the city would default by June. The mayor made another ill-fated trip to Washington, this time for an audience with the president, Governor Hugh Carey and representatives from Chase Manhattan, First National City Bank and Mortgage Guarantee Trust in tow; a federal loan guarantee, Ford told them, would “merely pospone the city’s coming to grips with its fiscal problems through needed budget slashing.” On May 29 Beame complied, announcing an austerity budget calling for the immediate elimination of 38,000 jobs, over 12 percent of all city employment, a four-day work week, and reductions in CUNY admissions, library and health center closures. He reaped the whirlwind: cops blocking the Brooklyn Bridge, garagemen pledging a pestilence of rats (oh, for the days of labor militancy! )—and no more money forthcoming from banks. On June 10 the state legislature in Albany authorized the Municipal Assistance Corporation, an authority with the power to borrow up to $3 billion in bonds to if city default appeared imminent—with the caveat that they didn’t have to lend money at all if the city did not squeeze its budget according to its specified terms, of which Felix Rohatyn became the most prominent member. By the middle of October Governor Carey had laid out an austerity plan he said went “to the limits of what we can apply to the city in terms of economies.” And President Ford considered backtracking: he hadn’t entertained the idea of a bailout. But now top advisers proposed he sign a package of loans for the city working its way through Congress. “Hell, no!” a right-wing chief staffer, whose name was Donald Rumsfeld, bellowed. He spoke for the mood of the room. And Ford said he wouldn’t stand for it. ford to city: drop dead ran the headline in the New York Daily News the next morning—the day before Halloween. Newsweek’s cover starred Abe Beame, swaddled like a baby, Gerald Ford spanking him over his knee. Rand Paul must have been reading Jerry’s speeches. If Detroit is bailed out, he’s said, ““Those who don’t have their house in order, who are teetering on disaster, will continue to make bad decisions…. You don’t set up an implicit promise from the federal government that everybody is getting bailed out…. It’s sort of like too big to fail for banks. If you have too big to fail for cities or for states and they believe they’ll be bailed out they’ll continue to make unwise decisions. Right. And if Rand Paul thinks the sole source of Detroit’s fiscal troubles is public salaries and pensions—not, say, the flight of the single industry in a single-industry town, or white flight, or the federal abandonment of urban policy tout court—I have an island to sell him. John Nichols on why banks get bailed out, but Detroit does not.